A spacious brick and flint cottage, part of a 200 year old converted stables in the hamlet of Ansty, set in an Area of Outstanding Natural Beauty. Close to Bulbarrow Hill which, at 900 ft, is one of Dorset's highest points with stunning views over the Blackmore Vale. Good walking country, with plenty of local footpaths. 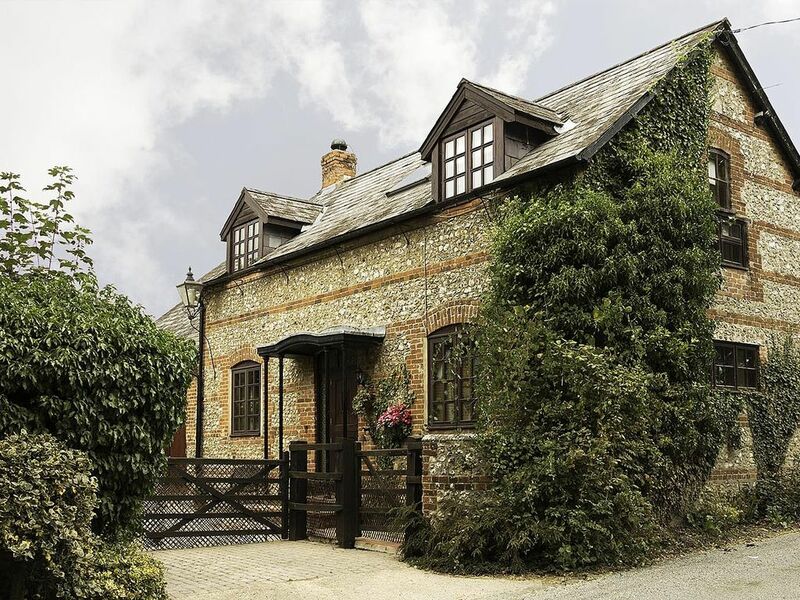 The property is 11 miles from Blandford and 12 miles from Dorchester, with easy access to the Jurassic coast and to picturesque villages and lively market towns. Just across the road from the cottage is the characterful Fox Inn with its Hall & Woodhouse ales and excellent food, and a few yards up the lane is the Ansty Farm Shop, supplying fresh and frozen food as well as gourmet dishes. No smoking. Family bathroom with bath with handheld tap shower, basin and WC. Ground floor shower, basin and WC. Inglenook fireplace with log-effect fire. Two sofas, TV with Sky+, DVD player, video player. Fully equipped, with Range master electric cooker with two ovens and five-ring hob, microwave, fridge, freezer, dishwasher, washing machine, toaster, etc. Small table with seating for two. 30 minutes to Warmwell dry ski slope. Golf courses in outskirts of Blandford and Dorchester approx. 12 miles. Notes on accommodation: Central heating, TV, DVD, wi-fi. Outside: Enclosed brick courtyard with picnic table and views over countryside. Cleaning / Towels / Linen / Maid service: Linen, towels and tea-towels are included in the price. Other: Dining room: Leading off kitchen with stable door to enclosed courtyard. Large dining table with seating for five, and large dresser. The house was very well equipped and spacious. We enjoyed the beautiful surroundings as well as the pub opposite. We would like to return. Lovely place with a great pub just across the road. The house is just what we were after and the host was really nice. Also great location to visit the coast and the rest of beautiful Dorset. Walking, cycling, bird watching. Horse riding close. Smaller beaches closer such as Ringstead. Bournemouth International Airport is approx. 40 minutes' drive away, taxis are available at the airport. Nearest train station is Dorchester. Rural situation, so use of car recommended. Directions available on booking. Right in the heart of Ansty village. There is a lot accessible including Brownsea Island, Aquariums, Sea Life Centre, Monkey World, Tank Museum, etc. There are lovely walks all around suitable for all abilities. County town of Dorchester is 12 miles with many shops, museums and other places of interest. Village shop and Post Office ATM - approx 50 yards. Tesco and, Waitrose will deliver direct to the Cottage. Booking Notes: A non refundable deposit of 33% will be taken at the time of booking and the balance is payable at least 8 weeks before the commencement of the holiday. Payment can be made by Bank transfer or cheque. Bookings will be confirmed when transaction is complete. Terms & Conditions on request. There is no mobile phone coverage in the immediate area. Payphone in dining room. One well-behaved dog welcome. Owner in neighbouring part of property has two dogs. Changeover Day: Friday is the changeover day. Arrival time is 4pm and departure time is 10am. Notes on prices: Weekly prices range from £410-£755. Open March to October inclusive.